Traveling with cats has its challenges. Cats are independent and usually calm when in control of their environment. However, when traveling with cats in carriers, their sense of security it taken away, and many cats experience high levels of stress. New sights, unfamiliar smells, the sound of traffic and new sensations of moving can overwhelm a cat’s sensory experience. Many cats react with anxiety or aggression when not prepared for the experience. Following the adage, “you can’t teach an old dog new tricks,” it is best to train and prepare cats for travel at an early age. Getting cats adapted to all of these new experiences when they are still kittens is the best way to ensure a good travel experience. Placing the pet carrier on the floor at home and letting kittens explore and play with it is a great introduction. After kittens have played with the carrier, give them some treats to reinforce their playful behavior. We urge you to also read our blog on other tips for taking a cat on a vacation. 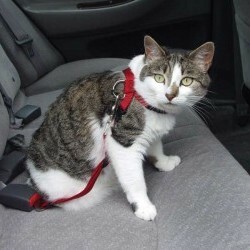 Using a gradual step-by-step approach, pet owners can place pets in the carrier inside the car. Turn the car engine on and off several times so the cats will get accustomed to the sound of the engine. The following day, take short trips around the neighborhood. These short trips will introduce the cats to new visual sights while getting cats familiar with the motion of a car. Throughout the week, the car trips can be increased. Adding a new sensory experience in step fashion will reduce sensory overload for cats. A good resource for products you may need when traveling with cats is Traveling Pet Supplies. Even with early training and preparation, there are some cats that may still exhibit anxiety during travel. There are over-the-counter natural stress remedies to help calm cats for travel. Some of these remedies are herbal formulas that ease stress without over sedating pets. Placing cat toys or catnip in the pet carrier can also help distract cats from the stress of travel. There are also homeopathic products for pet travel that will relieve anxiety, nausea and motion sickness. Many of these products come in liquid form and can be used for both cats and dogs. For high-strung cats, veterinarians can prescribe medications to help cats feel more relaxed during a trip. These medications include a large variety of anti-anxiety drugs, sedative and muscle relaxants. One of the most popular medications that vets prescribe is acepromazine. This medication works by depressing the central nervous system and results in muscle relaxation and sedation. Always check with your veterinarian first before giving your animals any medication. 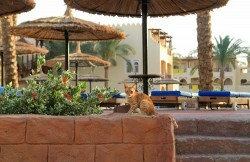 Training and preparing your cat at an early age is often the best way for your cat to be a good traveling companion. If that doesn’t work, natural remedies or a vet’s prescription are also appropriate. Now that you’ve got some insight into how to make it easy on cats to travel, make sure you take the proper steps to ensure you can relax as well. Remember, booking early is essential when traveling with pets. See what’s available today so you get the best deals. Start your search for pet friendly hotels here. Then sit back and think of all the fun things you can do when you reach your destination!